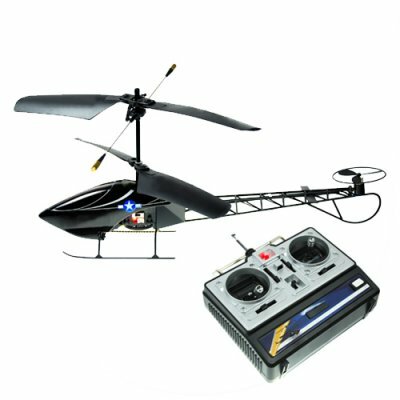 Successfully Added Deluxe Micro Helicopter with IR Remote Control - 110V to your Shopping Cart. Radio controlled deluxe version micro helicopter with a handheld 3-channel remote. This lightweight helicopter has tough but pliable rotor blades made of carbon fiber, therefore able to hold up to active usage and the occasional minor hard landing. The remote controller allows the helicopter to be flown and landed, hover in midair, and turn left or right. There is also a stabilizer bar on the helicopter that is controlled by the remote, so you can trim the helicopters flight and prevent flips and spins. This deluxe version has an extra wide control distance, a independent tail blade for improved forward/backward flight control, and one of the longest flight times you can get from a battery powered micro helicopter. No extra parts or accessories needed. Just put your AA batteries into the remote and you are ready for flight! The default charger for this product is for 110V AC. If you require 220-240V AC, please order CVSDA-A3402-220V. Is the micro Rc helicopter a copy from salvation 9? The micro RC helicoper is similar in style to the salvation 9, but better in function and design.